With everything to worry about on the big day, this Groom Kit has all his grooming essentials in one kit. Perfect to have available on the big day and pack with him on the honeymoon. After the wedding, keep for business meetings, gym bag or any other trip. The soft bag is able to be monogrammed. The bag has plenty of storage to add favorite essentials and has a hook to hang from door or hanger which makes it great for travel or to keep in the bathroom. 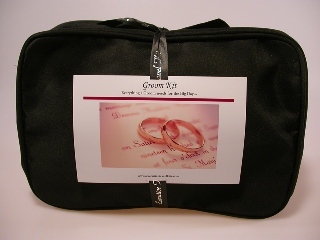 Filled with wedding day essentials this kit will come in handy for the wedding and honeymoon. The items are all packed in a soft black travel case which makes it easy to pack or tote along with you and makes it monogrammable. Newly added the 1 minute manicure making it easy to soften hands before the wedding or during the honeymoon and a Tan Cloth for last minute touch ups on the wedding day or during the honeymoon. The Little Black Bag ... for the bride. The Little Blag bag is a wedding gift essential. Filled with last minute items that a bride may need along with items that will come in handy for honeymoon travel. Perfect gift idea for engagement, bridal shower, gift from mom, maid of honor or to purchase for yourself. The soft little black bag is great for travel or for use as a make-up bag. Refills kits available.